There is one store near me that carries coconut oil, but the price is insane. I do a lot of my cooking with kerrygold butter, but sometimes butter doesn't cut it and I want to use an oil. I understand that olive oil is ok as long as the temperature is kept low, but I'd like to try coconut oil. What are the best online sources you've found for coconut oil? GREAT DEAL - Great brand & great price. Subscribe & save is an Amazon hack that everyone should know about. A great thing about coconut oil is you can have it for a year or so and it doesn't go rancid! Still tastes great too. I also get nutiva from amazon. Sometimes they have also subscription program, where you get 15% down. I get the 2 jars of 54oz. Wow- really? I've never tried their coconut oil but I know (online) a lot of people who use it. Thanks for the heads up- I love Nutiva, and with the two-fer deals it's as or more affordable than TT, but I was curious to try theirs. I think I'll stick to Nutiva. I am not a fan of Tropical Traditions coconut oil, but I do like their unsweetened dried coconut. I received several jars of rancid oil from them and switched to Nutiva. Use the code DDEALS and get another 10% off, so really a great price. [exp 12/31/10] Note that this is "expeller pressed", which involves some processing. What you really want to look for is: -virgin -organic -cold pressed Expeller pressed and/or centrifuge involves higher temps, more processing, often refined. Also, you will see labels claiming "Extra Virgin" - but it's just marketing. Unlike olive oil, there is no distinction between virgin & extra virgin coconut oil. WOW!!!!! amanzing price! thank you! ive ordered from vitacost a few times before and always got great deals and great stuff. thanks! another happy red palm oil user here! ive had it before but now i got trop tradition's. Awesome. It does indeed stain things, and it has a very particular flavor so some might not like it. But, its rad by us and it gives some vitamin E.
I have a couple jars of the red palm oil, it's good stuff. It will stain anything that comes near though, so be careful.. Thanks for the tip--the coconut oil is free if you spend $16 and pay shipping. I just bought a jar of the red palm oil at $19. With shipping, the total was about $27 for the two 32 oz. jars. I'm sure there are better deals out there on a per-jar basis without the shipping but I've not seen Red Palm Oil in any store. 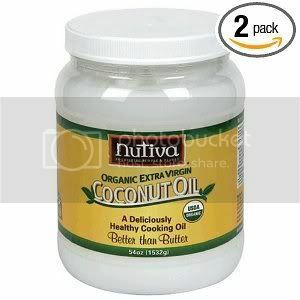 Also, if you decide to go the Nutiva from Amazon route, it helps to search for "nutiva 2 jar" or similar. I think the "BLUE BREEZE" trademark must have cost more :). It's not that big of a difference. Green Pasture 25 oz runs you $.68/oz for the 25 oz and Tropical Traditions runs you $.55/oz for the 32 oz. Awesome. Thanks for the quick answers! I've checked out Green Pasture and Tropical Traditions - does anyone know why there is such a big difference in price? I always buy in bulk - we use 1-2 gal per month, so I usually order a 5gal tub. I order from mountain rose herbs - I used to be able to get virgin, organic cold pressed for less than $0.25/oz incl s&h. I've noticed prices rising over the past 12mos, and the best prices I was able to find in Oct were in the range of $0.28-0.32/oz [these are for 5 gal tubs, incl s&h - but should give you a baseline to work from]. Coconut oil is very stable, so there's no problem buying a whole years worth or more at once. Even if you only use 2-3 oz per week, you'll go thru a gallon tub in 12 mos. Free shipping. No tax depending on which state you live in. If you sign up for their "subscribe and save" program it works out to $0.35 / oz. You can cancel "subscribe and save" right after your purchase if you wanted to. Just got my shipment last week. I like the flavor and smell better than the Whole Foods "365 Everyday" brand. I use Tropical Traditions. The gold label stuff is amazing. Virgin vs. Refined -- This is touched upon in comments above, but I thought I would clarify the difference in one place. Virgin coconut oil is the least processed and most definitely tastes like coconuts. It can be good for baking when you want to impart the coconut flavor. Refined coconut oil is virtually tasteless, and can be used for a wide variety of cooking. If you buy refined oil, make sure it is expeller pressed, and not solvent extracted (the cheaper brands most often use solvent extraction). My kids do not like coconut flavor so I buy refined oil for them and virgin/unrefined for me. Tropical Traditions is a good source if you don't mind all their annoying religious advertising (on Facebook). I buy Nutiva from Amazon. It can take some time finding the ones with the free shipping, but when I do, I just stick it in my wishlist so that I can find it easily again. They do a lot of two jar deals, such as the two 15oz jars for less than $14, or the two 54oz jars for about $40 (this is often out of stock, so you have to check back frequently). Just avoid the Spectrum refined coconut oil- it has a weird metalic tang to it. Blech. If you go for refined coconut oil (no coconut taste), Tropical Traditions is supposed to be the best and most affordable. Even their non-organic is sourced from farms that don't spray. One thing I forgot to say about Tropical Traditions, their "gold label" virgin coconut oil is extracted from coconuts using the same technique natives on islands have used for thousands of years. You can tell its quality after eating it off a spoon because it very refreshing and "rich". Light and smooth, too =) The "energy boost" that it gives me is very obvious, a quality fat if you ask me. Tropical Traditions is the best, the organic virgin coconut oil is amazing. I'm a big fan of Green Pasture (http://www.greenpasture.org). The shipping is pricey but I buy the 1 gallon size, which lasts forever. Here are the lowest prices I've found anywhere. Be sure to get the 76 degree food grade as its non-hydrogenated. They have both a refined and an organic virgin coconut oil. i like Dr Bronners brand the best, although I haven't seen it at many stores. its very unrefined and maintains a lot of coconut flavor. I like it better than nutiva and spectrum. its also fair trade grown, which is important to me. My favorite brand coconut oil is the WholeFoods 365 brand. This is the coconut oil that I use for several years now. Really love it not just because it's reasonably priced but also because it's all natural. I'm a huge organic lover.